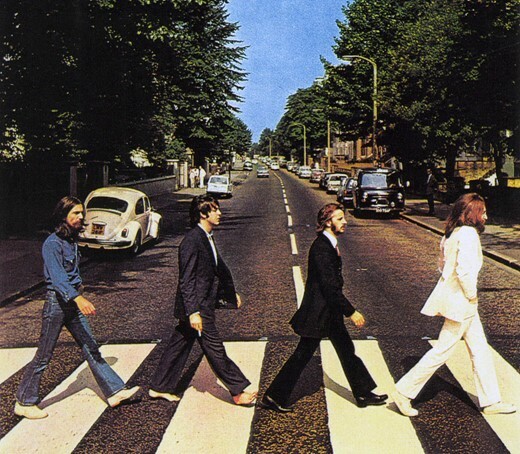 The photograph on the sleeve of 'Abbey Road' by The Beatles is among the most famous images in popular music, and it was taken 45 years ago today. The debate about whether Abbey Road was The Beatles final album continues (it definitely was though, and anyone who thinks 1970's Let it Be counts is just wrong) but for a whole generation of fans, the image of John, Paul, George and Ringo walking across the street outside Abbey Road studios in London signifies the end of an era. Fans gather on the site of the iconic Abbey Road photograph on August 8th 2014 - 45 years on from the original shoot. On that day in 1969, a policeman held up traffic for all of ten minutes to allow the photographer, Ian Macmillan to get his shot (based on rough sketches made by Paul McCartney). 45 years on, and hundreds of fans gathered at the very same zebra crossing to mark the anniversary of one of rock's most famous photographs. Some of them are still there. How did they get that photo without a digital camera that shoots 20 frames per second? "Oh no EXIF data? Picture too grainy! Guy in white to the right is too washed out! You no FF! You not know PP! You out! Amateur!" I was looking at a photo I took there the other day and if they have moved it then it's by a tiny amount. The White Walled garden on the left is about the same distance away. I still have the album. Have nothing to play it on but I can't bring myself to get rid of my old Beatle albums. I never thought of that. Thanks for the tip. And don't restrict yourself to eBay. Shop around. Use Google or your favorite search engine. Stop by Goodwill, Salvation Army and other thrift store. Take your time, there maybe better and less expensive than the first three or four you see. Best of luck. @JK - Agree. It is self-contained and is not too expensive either. I don't know the going rate now, around Christmas 2012, it was around $200. __ I'm holding on to my "ancient" Technics turntable, Pioneer amplifier, equalizer, dual cassette player, and monstrous speakers. Will pass the "components" and vinyl to my daughter. My nine and ten year old grandsons are fascinated by the technology. I still have, in pristine condition, a Dual turntable with a Shure capsule/needle bought new in 1974. It's a real joy to hook it up once in a while to my Sony receiver and listen to original vinyl records ( including this Beatles' Abbey Road )! I am the proud owner of a Rega Planar 3, Ortofon 2M Blue and Musical Fidelity X-LP. A combination that eats all but the most expensive CD players for breakfast. I use them as my primary source of listening. Digital music has made no progresses in terms of sound quality - on the contrary, the sound is getting more and more compressed and plain awful. Good for you. Since this forum is about the Beatles, would you care to share how you fit your Rega Planar 3 etc. into your VW Beatle and play your records while cruising on the freeway? Ignoring as much as possible the sheer stupidity of your question, I'll begin to say I don't have a VW Beetle (not "Beatle", mind you). When I'm cruising on the freeway in my Peugeot I mainly listen to radio, though I sometimes play CDs too. You see, there are people who actually listen to music (rather than simply hear it). Some even do it at home. Some still love vinyl (can you believe it? ), even though they have a CD collection and are capable of finding music videos on YouTube. I guess that must sound terribly strange to you, but who cares? I also thought Loraine was expressing her sorrow for not being able to listen to her LPs. Unless you show me how to play (or record) an LP without a turntable, I'll just deem your reply as ridiculous. Now, other than making a fool of yourself, what exactly was your point? You can always buy a usb turntable for less money than it would have cost to buy a 128GB CF card. In addition to the other replies, you can also get a USB turntable for fairly short money. You can hook it up to your computer directly and make digital files from your vinyl. I really don't understand this mania for converting vinyl LPs through USB as though records are disintegrating before our eyes. Vinyl LPs, unlike CDs or MP3s are inert and stand the test of time. I have thousands of LPs and haven't the slightest interest to "preserve" them, nor am I the Library of Congress, nor do I have the time to waste making dubs, which is very boring. When I want to hear that music, I stop what I'm doing and play that record. If I want some mobile music, I get, buy, source the gazillions of downloads available. If you buy a new vinyl album, you now get a high bit rate MP3 download of it with it. Those USB turntables are JUNK, so why bother. It's like making copies of your slides with a Fisher Price camera. I'm pretty sure there was a doc about the photographer who had shot this cover… anyone have any idea? There was also one I believe about the guy who shot and or designed 'Sgt. Pepper'… anyone recall the title of these films? And Canon The Fool on the Hill? Common guys, Leica Be ! Back in the USSR we have er Lubitel and Lomo? Nikon's pro DX line, The Long and Winding Road"
There are five Beatles in that picture, if you count the car. The Beetle (car) was probably one of the reasons why they took that photo. There is "Something" with this image. Yeah ... but stilll . I like it. Uh huh! That's what I like about photography . . . recording the "Moment" in time and for eternity. How many people all over the world cares what camera, lens, film, setting was used? Does it matter? Is it just me, or do places in the past look a lot more pleasant than the same place today? Its a good story to fill the gap.. Not sure what has talking about the great beatles album with Photography..
Thats spooky, only yesterday I stumbled upon the abbey road webcam and watched it for 10mins, the same tourists crossing the road over and over again to try and get a photo with nobody else in it. Hilarious, what must ETs think. Abbey Road was their last album because 12 days later, on August 20th, was the last time all 4 Beatles would be in the studio together. Oh yea, they were mixing tapes of Abbey Road songs. I shot everything as 14Bit, 40 MB'ish RAW files, some as Panos amounting to a workflow of 1,5GB per image counting the required intermdiate 16Bit TIFF files. The largest are 60 - 100 Mpixel and the dynamic range beats anything out there except perhaps phase 1. The ability to recover highlights and shadows in LR "with a little work" is astounding. Say when photographing a waterfall in a dark forest with some sky. I am aware about numerous discussions about 12 vs 14 bit - so I thought: the price of storage media has made disk space a moot point - it is all about quality now. Now 'hit me with your rhytm stick' ! Thank you - I am still dazed by our USA vacation - so fantastic! And hot, hot, dry - then Iceland so cold and interspaced with drizzles and fabulous photogenic rainbows. I got the album too, I thought it was great. Big fan. I am curious. You must spend eternity in front of your computer working with LR. After all those work, do you share those photos with family and friends? If so, how? At least 18"x12" prints hung on the walls or High quality large screen (at least 40") HD? Hi again ecube - I am opting for 4K TV in the "near longterm" within a year or so @ the recommende 65" - just on the wish-list. I am not an oiligarc. One line about the Beatles and then a diary of your photography. I only hope you have the best glass. Please regale us with the details. You probably don't even print. BTW, ANY digital medium format less than 5 years old looks better than any FF today. @Ryanshoots - It's my fault. It seems my sarcasm was interpreted as an encouragement. On the bright side, he enjoyed his visit to our country. Let's give him a break. @Hasa - Thanks for the link to your photos in Google. Excellent shots. I have Google account but have never posted there. I'll take your lead. I was trying to contact you in Google but can't find your email. Feel free to contact me by email. @ ryanshoots - on the same line: "I only hope you have all the medium format bodies produced during the last 5 years and all the FF DSLRs + glass, glass and then some" - or can you please point us to your comparison? We can add: all the landscape cameras built 50 years ago look better than any camera today - provided it is possible to get film / glass plates. I saw an exhibition in Vegas of prints in the 1m x 3m plus minus range done with a landscape camera WOW! @Ryanshoots - Your comment arouse my curiosity to see your photos. Unfortunately, your profile had ZERO entry in your Gallery. Would you be kind enough to provide links to where you post your work? I assume you have photos form at least one of your MF digital cameras. How about posting same subject taken with your best FF/lens combination and your worst MF / lens combination, PLEASE. I recall buying this album on the Saturday after its release and playing I want you (she's so heavy) over and over..The late great John Peel had played it in his radio show the evening before: I had to get it. The cover seemed to reflect and sum up something of the feelling of the previous 6 years and the end of an ERA. Significantly, Paul (or the stand-in) is the only Beatle on the shot not wearing flares and his cigarette is pointing downwards, the joker is laughing at him!! and not at the other 3. However it may not be a stand-in. Look at Paul. The left hand side of his suit Jacket appears to be being blown aside whilst the jackets of Ringo and John remain unruffled or blow backwards: Obviousy a manipulated image. How did they do that without P.S.? 28 if and all that. The covers of "Abbey Road" and "Sgt. Pepper" are almost certainly the most famous in the history of recorded music and are fitting icons for some of the greatest pop music ever. "Dark Side of the Moon" was certainly one of the best selling albums of all time, but the cover art is pretty pedestrian and never reached the universally recognizable status of "Abbey Road" or "Sgt. Pepper." There is hardly a person on the planet who does not know most of the songs on the two Beatles albums, but there are plenty who know only a few on Pink Floyd's. Also, the Beatles albums still sell very well to younger generations more than 40 years after the group disbanded. Can the same be said of PF? All of which suggests that the covers on AR and SP are the most famous in history and by a fairly wide margin. One might argue that there are albums with "better" art, but not that they are as well-known. My first thought in reply was Dark Side too. Very famous album cover, but it does still pale in comparison to Sgt Pepper and Abbey Rd. On the subject of the Beatles, watching that live webcam for a few minutes just drove home for me how universal the love was and is for the Beatles. What other group could inspire fans 45 years later to go out of their way to walk across a road to have their picture taken. If it was only an occasional fan that would be one thing, but it is literally non-stop. And it's not like it's old people visiting. I saw many, many young people doing the Beatles tourist thing too. Amazing. Elvis had a glorious run, but honestly his fanbase is fading fast while the Beatles seems to be endlessly renewed. You are right about Elvis. The people who listen to him today are mostly the same ones who listened back in the day. That's because his music, with a few notable exceptions, has not stood the test of time. The same can be said of almost all pop musicians of the past 75 years, and I have no doubt whatsoever that it will be true of today's teen idols. Their appeal is in the glitz and the spectacle that surrounds them, not in their music. Once the glitz fades, people will lose interest. Does anyone know where Britney Spears is today? Does anyone care? @Robgo2: If it wasn't for Elvis there would be no Beatles. Elvis introduced rockabilly to the world and the Beatles were basically a rockabilly cover band in the early years. If you think Elvis' music hasn't stood the test of time you're gravely mistaken. So much of today's rock and roll and country is influenced by the rockabilly sound that Elvis, Scotty Moore and Bill Black helped create. @JDThomas: No doubt Elvis was highly influential, mainly through popularizing black music with white youth, including the British lads who became the Beatles. But my point was that Elvis's own recordings have not been embraced by succeeding generations. Granted, there are still some Elvis impersonators knocking around, but who goes to see them other than people above a certain age? @Robgo2: Maybe you're not into the rockabilly scene. You don't come into contact with people that really dig Elvis. I'm not particularly old, just turned 40, but I have a collection of early Elvis records that's worth more than I'd like to say. I know tons of young kids that are really into Elvis. I know more kids that are into the Clash than the Beatles. You've got to look in the right places. Ask Brian Setzer, who sells out every show he plays if he thinks Elvis' music hasn't stood the test of time. Ask the Reverend Horton Heat if Elvis' music hasn't influenced them and allowed them to tour the world for the past 30 years playing rockabilly songs. It ain't all old dudes that listen to Elvis. His music is as relevant today as it has ever been. @JDThomas: Perhaps I'm not as hip as you, but it seems to me that Elvis's following these days is rather limited. My son, who is in his mid-thirties and is very much connected to the punk and indie music scenes, would not agree with your assessment of Elvis's popularity with younger generations. It's not non-existent, but neither is it very significant. FWIW, I am of the generation that grew up on Elvis's music. I remember distinctly just how quaint it became after the Beatles arrived on the scene. We liked Elvis as kids and teens but lost interest when something fresher and more creative came along. And as the Beatles matured musically, they essentially redefined popular music. Even musicians who follow in their wake and seek to return to the "authentic" roots of rock are deeply in their debt. I never said Elvis wasn't good or influential. I'm not knocking him at all as I love much of his music. Clearly he was a dominant force on the radio, TV, movies, newspapers, magazines, you name it for most of the latter half of the 20th century. His influence on music -- including the Beatles -- is undeniable. But interest in his music is nowhere near the Beatles today. For the most part, his fans are the older generation. I often listen to oldies stations and you just don't hear Elvis tunes as much as the Beatles, and on a much wider variety of stations. I don't know what places you are looking to find kids more into the Clash and Elvis than the Beatles, but it's not anywhere near where I am. 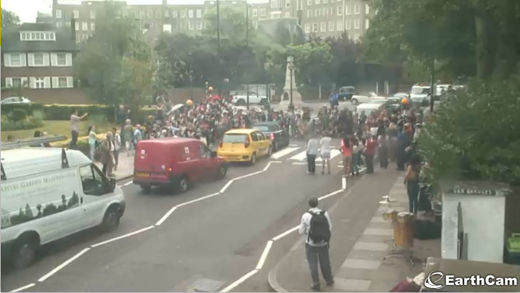 My comment was based on viewing the Abbey Road webcam for about 10 minutes yesterday and seeing literally dozens of people walking back and forth taking pictures. Young people mostly. I can't imagine there are a lot of youngsters hanging out at Graceland these days. @Robgo2: The funny thing is that your son may not think Elvis influences the music of today, but if you listen to it and break it down it's there. In the 80's when bands like Motley Crue were blowing people's minds they were simply rehashing 3 chord 12 bar I-IV-V blues and rockabilly rhythms. Contemporary bands like the Avett Bros., Kings of Leon, and Edward Sharp and the Magnetic Zeroes are doing the same thing. It's all based around the Pentatonic scale. You just have to look at it closely. It's there. And if you want to get down to brass tacks, when the Beatles put out Sgt. Pepper's and supposedly "redefined" rock music what they were actually doing was trying to one up the Beach Boys "Pet Sounds" which was released a year earlier. THAT was the record the Beatles drew inspiration from. And Brian Wilson was a huge Elvis fan. I just got back from London (work & vacation)... visited the Abbey Rd. site last week and made the crossing with about 50 fellow Beatle fans on either side of the road. It's a working street and I have only to say "thank God for the patience of London drivers!" If it were in New York there would be incredible death tolls weekly :o) ... some of the locals make a few quid by wearing yellow traffic vests and risking their lives to snap pictures of fans in the crosswalk with their various cameras and cell phones. The recording studio just a few yards behind the "Zebra" as the locals call these crosswalks has to endure the graffiti of thousands of fans who mark their tributes to the Fab Four. Rest in peace John and George! Interesting, but of the surviving members, Ringo has aged the best. Ringo Starr Wine is fine. And, Mark David Chapmann is alive and 3 of 4 Gibb brothers are dead. It was their best album. Strange, because most great artists shoot their wad in their first 2, 3, 4 albums. "the devil's message when you play the record backwards..."
Yeah, but what do you hear when you play the record upside down? And Strawberry Fields "I buried Paul" which was really John saying "Cranberry Sauce"
For those us lucky enough to be around and participate at that time was a real gift of life. and you report it with some crap webcam image. are webcams the next step up or down from phone cams? Sorry it was too far to get there and back from Seattle before lunch. So 45 years is 2013 or 2014? 2014 - the caption is incorrect. Did Ian shoot that with a D800 or a 5DMKIII ? Film has better dynamic range that those DSLRs. That's one thing film be. Especially if we're talking medium format, which was apparently the case here. Film has dynamic range, but not where it counts. Digital has the dynamic range advantage in the shadows and low light. ISO 6400 film was never good enough for wide usage, but now everybody has that setting on their digital camera and it looks fine. Right but this album cover is daylight and shot with low ISO film. That's where film is still strong in the year 2014. Unless you want to shoot Foveon and that new sensor still drops of in usefulness above ISO 400. Yep, digital allows the shooting with no flash in much more varied circumstances than film. Has been true of APSC sensors since at least as far back as 2004, and there was big leap with the mass adoption of CMOS sensors and the introduction of the Nikon D3. Still not much to to with why the colour in this photo is so good. There are plenty of current, year 2014, ISO 6400 "capable" digital cameras that really shouldn't be used at ISO 6400, eg the Panasonic GH4. So there are reasons to use film today in 2014, and one big one remains dynamic range. Most big budget movies are still film, which is then scanned for editing, so too many TV dramas in the US. The stuff that is actually useful for people who like daylight (aka the stuff between sunrise and sunset). And yes, colour negative film has stupid amounts of DR in highlights, where it matters when taking shots in daylight. Which is the opposite of digital cameras, where you have to stop them down even more to protect highlights and it's more like shooting at ISO400 or 800, and then digging up shadows (with it's colour shifts). PS: I do shoot film in daylight and mostly digital at night. @Graybalanced - Sorry, did you just indirectly make the assertion that had this image been taken with a digital camera (which you believe has greater DR) it would have a) been necessary to boost shadows, and b) because that is where DR counts the most would have made the image better in some way? Would it improve the image to see under the cars and make out a few leaves in the shadows, on a bright sunny day, because that is where DR matters the most?? Depending on the format, one can develop film beyond the DR of digital sensors of today. The problem, and hence the debate, is that there are not many people able to do that under a day to day workflow. The correct statement would be that many people will get better results with digital than with film. This is simply a result of digital development being easier, and through software (as opposed to chemicals) within reach of the masses, so you see vastly more examples of 'great' digital images than you do 'even better' film images. Here we go again. Some people wanting to impress with their "know it all". I shoot film and Polaroid during those times. Now and since 2004, I shot exclusively digital. Day or night, if the ambient light is not sufficient for my purpose, I use artificial light as needed. I prefer to enjoy and document the outdoors during the day that high ISO is irrelevant. There are more than one way to skin a cat, LET IT BE! To each his own, do and enjoy your toys and let me enjoy mine. I was shooting about that time, and slide film was either ISO 5 or 10. It was a struggle to get a fast enough shutter speed to stop motion. Amazing how we have selective memories. Not saying I'm sure, but Wikipedia says the ISO for 35mm Kodachrome in the 1960s and early '70s was 25ASA to 64ASA. Those lower ASAs you cite are from earlier in the history of slide film. .. because it's an image from the traffic cam from today. What a technically cool shot that was. To get those four looking so casual as they crossed in symmetry! Only Paul is out of step (deliberately?). The only thing that hurts my eyes is that the dotted white line is not in the center of the image. Well, you can't have everything and it certainly doesn't stop this from being one of the coolest shots ever, accomplished in only ten minutes. I wonder how many people of that era could take the Beatles or leave them but bought this album instead, lured by the cool cover? Out of step keeps the shot from looking like a military march. As the proud mom watching the parade, her son was the only one in step! Ringo is also left handed. Then why's the cig in his right hand? I beg to differ, John, George and Ringo are out-of-step. Great memories, I was 21 then! I still have that vinyl Album bought at that time ( among others from The Beatles ). I was 13, and got it the week it was released in Brazil. It was mono, of course and I still have, pretty scratched though (I'd take it to the beach and played it on a portable Phillips player). A huge success with the 12 year old girls. I think this is one of the greatest album covers of all time. It's a simple picture, yet amazingly difficult to bring off - as anyone who has ever tried to take a duplicate version will tell you. Imagine if you'd been asked to shoot the Beatles that day; could you have come up with an iconic shot like this given the surroundings? Placing the Beatles on the crossing was inspired. The way the four Beatles are equally spaced on the crossing, with their legs perfectly aligned, creates a wonderful sense of symmetry and balance. Given the very different clothes all four were wearing that day, a normal group shot would have looked very unharmonious. The image looks to have been taken from a fairly high vantage point - the photographer must've been standing on a ladder? - and that's another reason (aside from the original crossing having been moved) why it's so difficult for amateurs to replicate this shot. From the DPR description, it sounds like the photograph was very well planned and perhaps even rehearsed (to get their stride properly). There were probably many passes and the photog probably took multiple shots and picked/cropped the one where the legs were in perfect pattern. Planning/Drawing was the easy bit - Ian Macmillan still had to translate Paul's rough sketches into an iconic photograph. And, without question, he fulfilled his task magnificently. An iconic picture, one of many that need to be refreshed from time to time. Thanks for the memories DPR! I selfishly miss John the most. So many great songs never written and recorded, because of his murder. He was always my favorite Beatle. A great song writer and humanitarian. ...because stabbing him to death would have been so much better? It certainly would have been just as easy. You shoot me and it's likely I'm dead. Try and stab me and there's a good chance that you'll end up dead too, or we may well both survive injured, especially if there are people to intervene. Gun+lunatic/psychopath= massacre. Can you easily massacre people with a knife? How many schools have had such blights visited on them by knife men? Apologists for the right to carry munitions make crazy arguments. I heard Paul on the AR studio TV show playing and singing I've Got a Feeling, then I waited to hear John singing "Everybody had a good year ..." It never came. Yes, he's much missed. A quick search on Wikpedia lists approximately 33 massacres by knives. And John Lenons death has nothing to do with a massacre and the person that shot him wanted him dead I am sure he would have stabbed him with that intent and probably many times. 33? How many gum massacres did google bring up? I can only [in the UK] think of one massacre attempt by kinfe [machete actually which if you think about it would be far more effective as a fearsome weapon capable of more egregious physical harm]. Inevitably it was an attempt on the lives of infants. You know what? It was halted by a brave woman who whilst sustaining seriously injury did manage to protect many of her charges. What chance of that against a semi-automatic? Lunatics will always be around and they'll always murder whatever the means - it's just that putting guns and bombs in their hands contributes to the insanity of these circumstances. If she had defended the children with a semi-automatic, she would have been spared injury. I see the error in my thinking - all nursery supervisors should be issued with machine guns in future. You mean like they do in Israel? Yeah, but under the proviso the tots get hand grenades to defend themselves if their carers lose it. Of course then you'd need flak jackets for their baby siblings in case you get a jealous and careless one and we'd have to work out some way of enabling infants to hold and aim bazookas. To hell with all that - what we need is everyone to have a personal nuke. I can't see what could possibly go wrong. You're with me, right? Is that what they do in Israel? I don't recall reading about that, just that all teachers at all levels are equipped with fully automatic weapons, but I never read about attacks on schools in Israel, at least not anymore. Damn, I was -16 years old! I lived a couple of miles away and the original crossing went years ago, it's now in a different place..
Why on earth choose 45 years as an anniversary? Wouldn't 50 have been far far more sensible, if not then why not 37 or 42 years? By the time the 50-year anniversary rolls around, Paul might genuinely be dead. Everyone here knows the story. You read it here Last! some of us aren't 60+ years old so go for it m8. I hate to burst your bubble but Paul was born in 1942. The shot was taken in 1969. He would have been 27... Not 28. Paul's also out of step with the others and has his cigarette in the wrong hand -- he was left handed. He was 27, but would have been 28 IF he'd made it to his next birthday. Don't let a silly thing like math get in the way of a perfectly good crazy rumor! What about the Let it be album? Why shouldn't it count? Maybe you don't like it, but that's another question. Weeeeeell.... so this debate has been going on for more than 40 years, but basically, Let it Be was almost entirely recorded before the sessions for Abbey Road, even though it was released later. And the last time all four Beatles played together was on Abbey Road. 11 of 12 songs were recorded in 1969, before they even started to work on Abbey Road album. The last song - 'I Me Mine' - was recorder in 1970, yet without John Lennon. Moreover, the 'Let it be' album was released already after the band broke up. Didn't Ringo have an album with all four Beatles on it after the breakup? Although they all contributed to different songs, so they did not play together on it. 'Ringo' - it's a pretty great record, actually. Arguably among the best post-breakup solo efforts. Hasselblad camera with a 50mm wide-angle lens, aperture f22, at 1/500 seconds. That was it, "Ringo". Its a great album. I just read that George, John, and Ringo all worked on Johns' song "I'm the Greatest" in Los Angeles. Paul, Ringo, and Linda worked on the song Paul wrote at Abbey Road studios. Apparently, Paul couldn't visit the States at the time because of a drug charge. Too bad, all four may have worked together on "I'm the Greatest". I know, just a dream. There's no way it would have happened. But still fun to think about. Abbey Road was the last album they recorded, but not the last they released. The final lyric on Abbey Road (not counting Her Majesty) was "And in the end, the love you take is equal to the love you make." I prefer to think of this as the final message of the Beatles era instead of "Thank you on behalf to the group and ourselves and I hope we passed the audition" in Get Back.